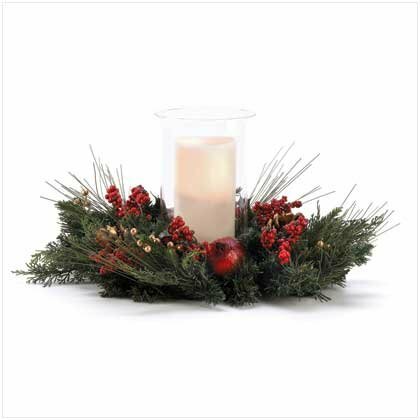 Delight your family and stun your guests with this elegant holiday greenery display! LED pillar candle placed nicely inside the hurricane lantern adds an enchanting glow and uplifting evergreen pine scent; flameless LED lighting lets you enjoy its beauty worry-free. For indoor use only. Faux plant, wax candle, and glass. Three C batteries not included. Set: 21" x 14" x 10" high; hurricane lantern: 6" diameter x 10" high; LED candle: 3 3/4" diameter x 8" high.